ANAHUAC, Texas (AP) — A southeast Texas sheriff said Sunday that two bodies have been recovered at the site where a Boeing 767 cargo plane crashed into a coastal bay. All three people aboard the Flight 3591 died, according to the plane’s owner. Crews continued to search for the third body at Trinity Bay, about 35 miles (55 kilometers) east of Houston, Chambers County Sheriff Brian Hawthorne said at a Sunday afternoon news conference with officials from the National Transportation Safety Board and the FBI. 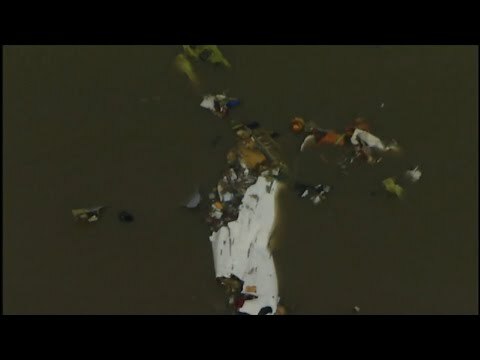 The plane’s owner, Atlas Air, confirmed the deaths in a statement on Sunday, and said its “primary focus is working to provide the families of those affected with care and support.” Atlas was operating the flight for Amazon when it crashed Saturday afternoon near the small town of Anahuac. Mesa Airlines said in a statement late Sunday that one of its employees, Sean Archuleta, was one the plane. Archuleta had been a pilot for Mesa since 2013. The other two people have not yet been identified. NTSB Chairman Robert Sumwalt said security video from a jail about a mile away from the crash site showed the plane heading toward the ground nose first. Sumwalt added that air traffic controllers reported rain in the area, and that the plane did not send out a distress call before the wreck. Civilian volunteers in small boats helped search part of the bay, but Hawthorne told The Associated Press before the news conference that the volunteers will no longer be used. Jason Campbell was among the civilian boaters who checked the debris on Saturday. What the boaters found was grim. Sumwalt said that finding the flight recorders remains a high priority for searchers. The jumbo jet had departed from Miami and was likely moments from landing at Bush Intercontinental Airport in Houston when it crashed. FBI Special Agent in Charge Perrye Turner asked that anyone with debris on their property contact authorities.